This is a downloadable e-book in PDF format. 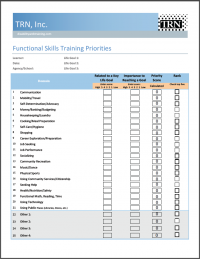 This material is in response to a strong demand for practical and sound marketing and job development advice. The book updates approaches to include the web, social media, and the widespread use of online hiring. 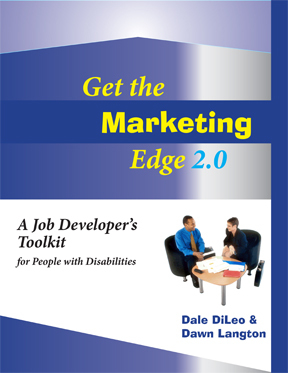 The premise of this book is to utilize effective marketing principles and strategies in a respectful way for each group with whom you work, especially in the portrayal of job seekers with disabilities. Language, image, marketing tools and approaches are always presented with the idea of representing an individual who is, first of all, a person with skills and abilities that can benefit a business. 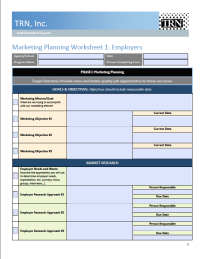 Part One of this book focuses on marketing planning and tool development targeted to the group that does the hiring: employers. It deals with meeting employer needs to match individuals with community jobs. But good market planning and well conceived job development tools alone will not ensure quality job placements for the prospective employees you represent. Part Two deals with understanding the needs, skills and preferences of each potential worker to make those matches work. It then discusses ways to personalize the job development process – to utilize your market positioning, employer education and job development tools to the advantage of each individual job seeker.